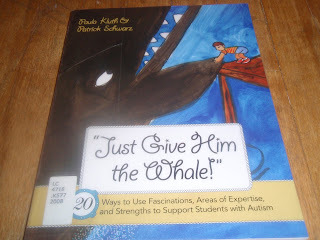 Autism Blog: Just Give him the Whale; 20 Ways to Use Fascination, Areas of Expertise and Strenghs to Support Students with Autism. This is a very interesting concept. I have a daughter on the spectrum who was struggling with reading, she is also obssessed with horses. Her resource room teacher gave up on the "reading curriculum" that the school uses and started letting her read every horse book she could find and it worked. My daughter picked up on the site words and went from there. She now loves to read about everything.